When I first saw the framing for the groin ceiling in the vestibule just off the foyer I was curious about the final result. The construction isn’t quite finished on the groin vault ceiling but it is coming along nicely. A groin vault isn’t an easy choice for a ceiling but I’ve come to expect the unexpected at this English cottage-style home at The Retreat. The Romans were way ahead of their time, regarding construction, in many ways. Don’t believe me??!!! Read this from a small sampling of their extraordinary construction innovations. 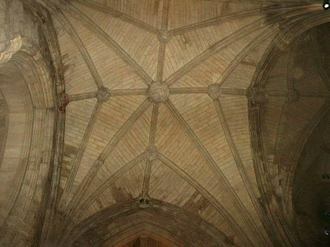 The use of groin vaults was one technique used to help alleviate the immense outward thrust of masonry vaults on the walls supporting it. An ingenious technique, indeed. 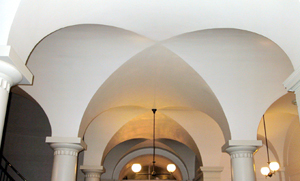 Heck…even The White House has an example of groin vault architecture. 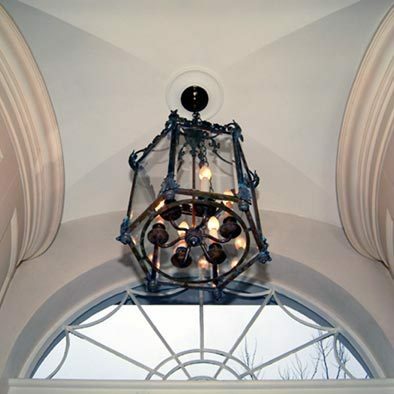 Taking on the construction of a groin vault ceiling for this home meant that the builder would need to have in his employ skilled craftsmen, such as Isaac Tate (right inset) , to frame it and another generously skilled craftsman to plaster it. He obviously has that part handled because it has turned out beautifully. Wanna see more examples of groin vault ceilings?